Looking through my archives tonight has forced me to accept that yellow isn’t one of my favorite colors. It’s not something I can wear successfully and it looks like it isn’t a color I photograph often. Actually I’m kind of surprised I don’t have more photos that feature yellow as I do like the warm sun and happy flowers but for this challenge I am left with this image of an old school bus that has seen better days. Don’t worry, it doesn’t carry children anymore but it’s found a new life in retirement transporting vegetables to the Edmonds spring and summer farmer’s markets. Posted as part of Sue’s A Word A Week: Yellow. That’s antique. Now I wonder how a bumble bee feels being yellow and stripes? I’m also very short on yellow photos, Lisa, probably for the same reason as you. 🙂 Glad the old bus has been given a reprieve from the scrapyard and is doing useful work again. I would love to own that bus! It nice to know the bus is taking on a new assignment–transporting vegetables to… That is so cool! Nicely done Lisa. I like the desaturation! I never thought to use a school bus ( I have a few photos of those) or indeed a bee as someone else mentioned (I have a few photos of those too!) as for wearing yellow I don’t. It just clashes horribly with my skin tone – though I do recollect having a very bright yellow PVC mac when I was a teenager – it just made me sweat horribly!! Like being wrapped up in cling film! Eew, that sweaty memory would be enough to keep me off yellow all by itself! A creative solution to the yellow problem! Thanks so much Nia. 🙂 Yellow is a funny color and it’s been great to read so many different reactions to it through all the yellow posts this week. Excellent and I have not seen a smaller bus around these parts in many years. great shot. Thanks Ruth. 🙂 Most of the busses nowadays are long but I like the little ones! I don’t think there’s anything wrong with not liking a color, but this picture turned out perfectly. I bet there is a lot of yellow on the inside too ;). What a great photo, Lisa!!! 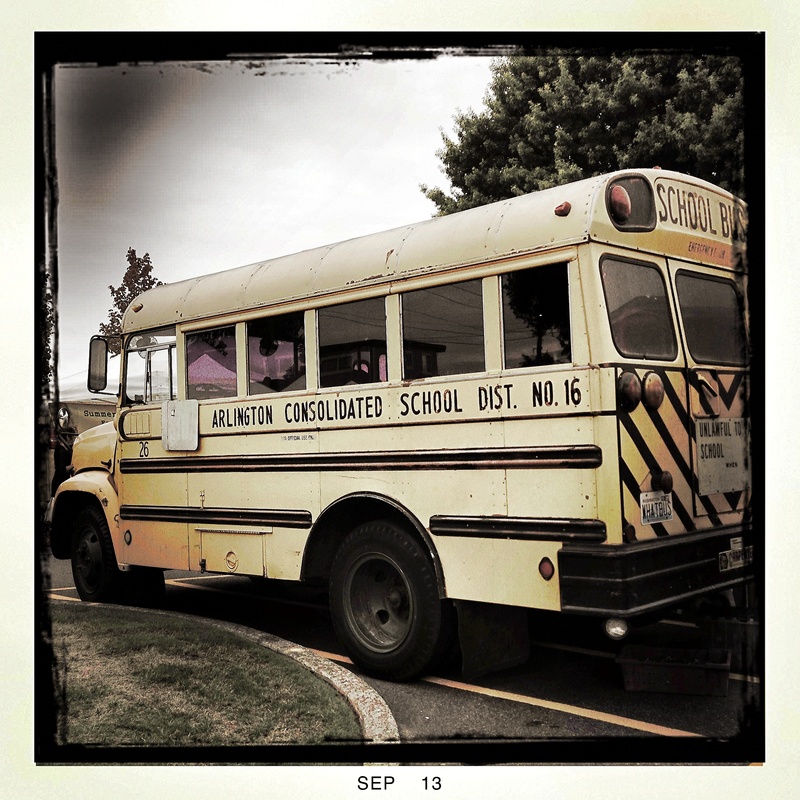 School bus with a second life. It could have a third if someone parked it somewhere and converted it into a small restaurant.